On Friday June 7th 2013 were in New Castle Pennsylvania. 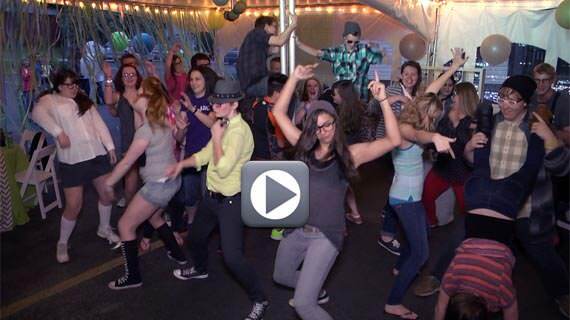 The event was a sweet 16 Party for Makenzie Wimer. You may recall last year I was the DJ for Makenzie’s sister Caitlyn Wimer’s Sweet 16 Party which was held just a few miles up the road from today’s event. The theme for the party was Geeks vs Hipsters and was wonderfully planned out and decorated. Guests began arriving to the party at 7:00 pm where they were given the choice of some fashion accessories that promoted themselves as either a Geek or a Hipster. The guests all enjoyed butler passed comfort foods, a large candy buffet and even a late night s’mores bonfire. At approximately 9:00 pm all of the guests sang happy birthday to the guest of honor and then Makenzie’s father Mr. Rick Wimer welcomed all of the guests and gave Makenzie her birthday present; a new Chevrolet Equinox. Throughout the evening, the kids danced to all of the latest music which was provided by DJ Pifemaster. They also participated in several contests such as hula hoops, walla balla, jukebox eliminator and thread the spoon. Winners of the contests were each awarded iTunes gift cards. The sweet 16 party lasted until 11:00 pm.